We went to the pediatrician on Wednesday and guess what...Reese still has an ear infection! So yesterday we went to the ENT, and it is now official-she'll have tubes put in on April 4, so please keep us in your prayers. I'm really OK with this...I just want her to feel better. I know they are still bothering her. She constatly has her fingers in her ears, and if she can find anything else to stick in there (keys, bobby pins, Q-tips) she will, as long as she thinks we can't see her-SCARY!!! Randon is crazy busy with baseball, and is also fighting a sinus infection. It doesn't help that it's been so cold and windy here for the past few days!! I had an interview for a p/t job last week, and I'll have a working interview on Tuesday. If I get the job, I'll start on Thursday. The dentist is very nice, and he is very open about his faith. They start each morning with a prayer meeting. I must admit, I'd like to get the job, but I know that he's praying about who he hires, and I know I'm praying...so I'll be at peace whatever the outcome, because I am confident it will be God's will. This morning she came into my room and told me that Reese was "just jacking around." WHAT?!?!? We started using a little prayer model for when we say our goodnight prayers with her. One part of the prayer says, "One thing I would like God to change about me is..." Her prayer was that God would change her into a fireman. Not too sure she got the point, but maybe with some time.. 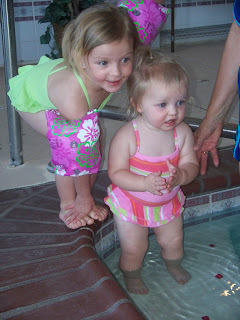 Here is a picture of the girls swimming at the hotel with PaPa and Gran last weekend in Lubbock. My children are such a precious gift!! Be blessed. I will be praying for sweet Reese! Dang ears! OH, and I loved the picture of the pigtails. 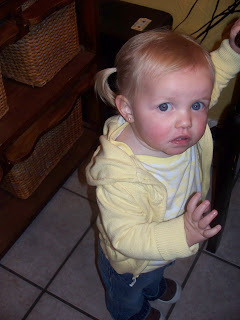 I remember putting Mia's in pigtails for the first time. It was my favorite for hers! 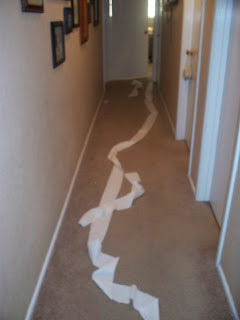 Can't wait til I can do that with Eisley! Which might be awhile, since she is now starting to lose her hair. Not fun! Your girls are a blessing and a delight to everyone who knows them I am sure! I miss them and ya'll! Your girls are so adorable. 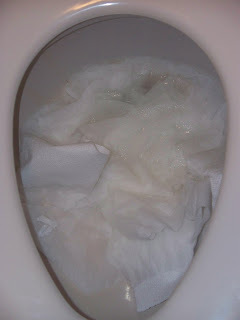 I love your blog for all the pictures! I am happy that I get to watch them grow up from soooooo far away! love you guys tons and miss you more than that. This is such a cute blog! You're doing great keeping up with it, Jennifer!!! horray for us, right?! 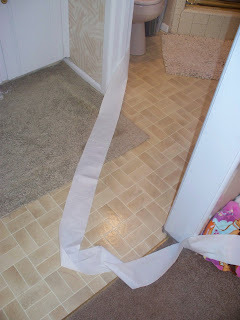 I LOVE The pictures of your girls and Reese's potty story! We'll keep her in our prayers and especially her parents as you go through the ear tube surgery. I'll also be praying about the job for you. God has this place just for you to be! And Jessilyn's sayings are hilarious, btw! Your life isn't dull, that's for sure! how's Reese doing? How about the potential job? We def. need to catch up! I never was able to get coffee with those beautiful ladies! :( I'm bummed... we'll try about next Thurs. if you can come! haha! I wish!